Holiday sales are growing in line with expectations, although the level of promotional activity raises questions about the most important outcome: profits. In this issue, we recap November and early-December sales results, take an in-depth look at the volume of promotions and its implications, and offer ideas for infusing more profitable strategies into holiday pricing. Deeper promotions. Doorbuster deals are again in full swing this holiday season. Discounts of more than 50% on Black Friday, for example, brought TV prices to record lows; and discounts on toys reached 75% on Cyber Monday. In collaboration with 360pi, we assessed daily online price changes over the first half of the holiday shopping season.2 Looking at prices from November 1 to December 2, we found that, on average, discounts have been deeper this year than last. In electronics and computers, more than half of retailers offered even lower prices this year compared to last year’s deeply discounted prices; and in toys and games, one retailer dropped its average price by more than 2.5 times its average discount last year. Broader promotions. Retailers are continuing to discount broad assortments of goods this year, with storewide discounts being used aggressively. Bain worked with SaleTally to examine the extent to which retailers offered storewide discounts this November.3 Over half of the 17 retailers analyzed ran storewide promotions this year, indicating a significant breadth in discounted assortment. Average storewide discounts were over 35%, 5 percentage points deeper this year compared to last year. Longer promotions. With retailers offering Black Friday discounts even earlier this year (see Bain’s “Retail Holiday Newsletter #3: The sprint toward Christmas”), promotions are running longer. Data from 360pi on daily online price changes show that some retailers had started promotions in electronics and computers by November 1 and ran discounts for more consecutive days than last year. Retailers also extended Cyber Monday promotions: Bloomingdale’s, JCPenney and others launched online discounts the week before Cyber Monday and continued the deals through the following week. More frequent price changes. Dynamic online pricing has exacerbated holiday pricing madness. Our partnership with 360pi looked at the frequency of price changes by examining the percentage of products that changed price from the prior day, for a sample of 5,000 SKUs. In November, Amazon.com changed its prices on an average of 20% of products in the assortment, more than any other retailer. This holiday season, more retailers are responding in kind. Office Depot, for example, changed prices on 30% of its products on the Saturday after Thanksgiving; that rate was just 18% on any single day last year. Price differentials are moving more closely in sync with Amazon.com this year as more retailers resolve to keep pace with the online giant’s price changes. 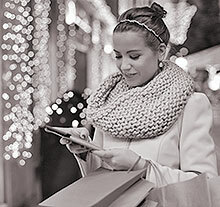 Holiday pricing: Making sense of the madness – Bain Brief – Bain & Company.